Grattan (left) and Evelyn Betancourt stand in front of their home in Fort Washington, Md., in one of the wealthiest majority-black counties in the United States: Prince George's, just east of Washington, D.C. But the reality, Grattan says, is "that many people here, even though they've lived here for many years, are fighting to save their homes" — the Betancourts among them. 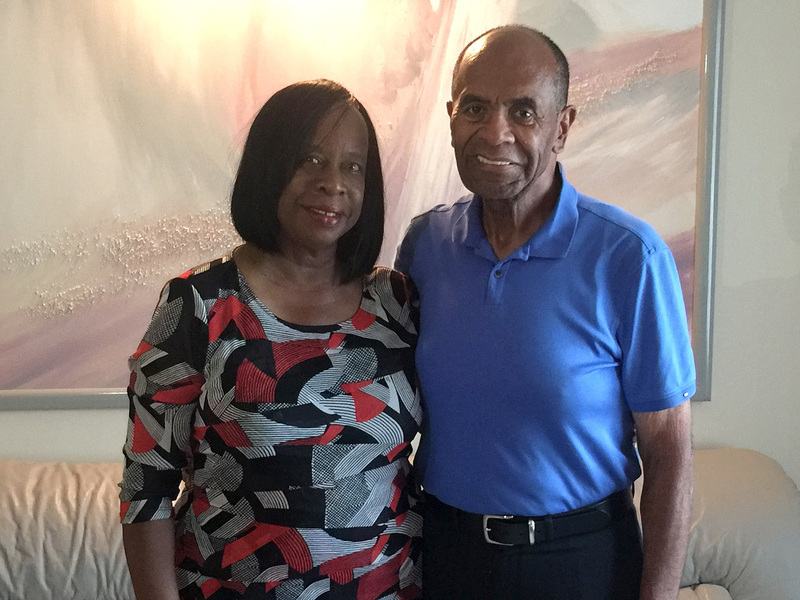 Evelyn and Grattan Betancourt bought their "forever" home in 1986. It&apos;s two-stories tall, with a brick front and a wide lawn. Some evenings, deer come out of the woods and linger in their yard. "This was our first, and it&apos;ll be our only home," says Evelyn. The Betancourts live in Fort Washington, Md., located in one of the wealthiest majority-black counties in the United States: Prince George&apos;s, just east of Washington, D.C. The median income in the county of about 900,000 people is $73,000 a year — more than $20,000 higher than the national average. "When you look at this neighborhood, it has kind of a look of middle class prosperity," Grattan says. "But the reality is — and we&apos;re aware of this — that many people here, even though they&apos;ve lived here many years, are fighting to save their home." Around the country, black middle class neighborhoods have recovered from the housing crash much more slowly than white neighborhoods. More than a quarter of the homes in Prince George&apos;s County are underwater — in other words, the owners owe more than the homes are worth. And the Betancourts are among them. Their home is worth a little more than $300,000. But they owe nearly $500,000 on it. They still remember when they bought this house. It was new construction, and they added special touches, like a bay window. "Even though that was 30 years ago, we started thinking of the future," Grattan recalls. "We wanted a home that didn&apos;t involve a lot of steps, because we knew that one day, steps would be a problem." "We were going to stay here. It wasn&apos;t that we were gonna be here for a few years and move on," he says. "This was where we were gonna live the rest of our lives." In the Betancourts&apos; case, they had almost paid off their mortgage in 2005, when Grattan needed open-heart surgery. The bank suggested that Evelyn — who, when asked her age, says she&apos;s "holding at 66" — cash out her retirement plan. She liquidated everything and took out a loan on the house to pay her husband&apos;s medical bills. And then — Evelyn had an accident on the job. And that, her husband says, hurt her earning ability for a while. Both of them had to scale back their hours at the Ford dealership where they&apos;ve worked for more than 30 years. They fell behind on payments. "Being in the, quote, middle class, it gives you opportunity, but it doesn&apos;t give you immunity," says Grattan, 73. "And the further up you step, the harder it is to stay there." Though it&apos;s impossible to say that a particular loan or a particular action by a bank was motivated by racism or discrimination, lawsuits and Justice Department investigations show that black homeowners consistently have been given worse deals than white homeowners. And in Prince George&apos;s County, one of the wealthiest majority-black counties in the country, the foreclosure numbers are high and the rate of recovery has been nowhere near that of the rest of the country. Race plays a role, as well as age, says Evelyn. "You have people that are in their 60s and their 70s that don&apos;t understand the paperwork. They&apos;re told, or they get a certified letter, and in my case with my husband having a bad heart, do I decide to show it to him, or share it with him, or do I put it away?" she says. "And then sometimes you put it away and it&apos;s too late to try to be able to unravel what you&apos;ve got into." For the Betancourts, though, it might not be too late. They&apos;re working with a counselor named Luis Perez with an organization called the Housing Initiative Partnership. "The majority of people who walk in here are middle class," Perez says. His small office in Hyattsville, Md., has plants and a fish tank, to help people relax a little bit. "I&apos;ve seen a lot of tears, I have. I&apos;ve seen people come in here stressed out, worried, can&apos;t sleep at nights," Perez says. "They know they&apos;re gonna lose their homes." Most of his clients are black or Latino. He says about 30 percent of them manage to hang on to their homes. And when he tells people not to lose hope, he speaks from personal experience. "I went through exactly what the people in front of my desk are going through. I did lose my house," he says. It&apos;s a familiar story: Perez got laid off in a merger, went through foreclosure and bankruptcy, and then moved into a tiny apartment. It took him five years to rebuild his credit. He tells his clients about what it was like, to show that they can bounce back too. "OK my wife was not working. The stress that we went through. The sleepless nights that we went through. The fear. And the decision that I had to make. Because I was afraid of being thrown out on the streets," Perez says. Now he&apos;s about to buy a home once again. At work, he&apos;s negotiating with the Betancourts&apos; lender, trying to get a repayment plan that&apos;ll let them stay in their house without having to go through the trauma he experienced. "I think that we got a pretty good chance of keeping their home," he says. But even if they do keep their house, any prospect of retirement or taking a vacation seems far away for the Betancourts. Kris Marsh is a sociologist and associate professor at the University of Maryland who studies the black middle class. "We often talk about how when white America gets a cold, black America gets the flu," she says. Marsh is also African-American, and lives in a beautiful home in Fairwood, an upscale housing community in Bowie, Md., which is also in Prince George&apos;s County. Most of the homeowners in Fairwood are black — and Marsh says the houses are worth less than they&apos;d be in a similar neighborhood that&apos;s majority white. "The fundamental truth is it&apos;s a racist housing market," she says, laughing. "But if we kind of unpack that and add some sociology around that, we have to look at the resources that whites had before the issue, the problem that we had in the housing market, and how that helped them to rebound so much quicker," Marsh explains. "Blacks didn&apos;t have those resources, so when an emergency ... or a crisis happens, it&apos;s a little bit harder for them to bounce back." For today&apos;s middle class, this is a constant theme: You can get by alright — until there&apos;s a medical emergency, or a tree falls through the roof of your house. One big surprise expense and you&apos;re suddenly in free fall. Fairwood is a lovely neighborhood, dotted with duck ponds and playgrounds. "It is really great to have a cardiologist live next to you, and have an executive police officer live to the right of you, and a geneticist live down the street. ... And they&apos;re black," Marsh says. "But then on the flip side, it&apos;s like, are we living here by choice, or are we forced to live here? Is the housing market constrained?" Would she would prefer to live in a neighborhood that&apos;s more evenly divided racially, say 30 percent black, 30 percent Latino, 30 percent white? "Well those places don&apos;t exist, because whites live in predominantly white areas," Marsh replies. "But here&apos;s how I&apos;m going to answer that question. Is it more important for my psychological well-being to be in a predominantly black neighborhood? Or is it more important for me to build equity faster in my house?" she says. "And if (the latter is) the case, then I should live in a more mixed community." Because despite how gorgeous houses are in her predominantly black neighborhood, her home will not increase in value as quickly as if her neighbors were white. There&apos;s a grand mansion at the center of Fairwood, which was built on land that once held slaves. That building is the Fairview manor, the original plantation house. It was the home of Oden Bowie, the Maryland governor whose family the town is named after and who still retain ownership of the mansion (which is currently for sale). Marsh lives on a street named after one of those slaves, a woman named Hattie. "I&apos;m pretty sure Hattie was a cook," Marsh says. Marsh feels a bit like she&apos;s reclaiming history, but it&apos;s also painful. "Every morning when I&apos;m like, &apos;Yeah, I&apos;ve arrived,&apos; I gotta drive past that," she says. Hattie was never allowed to own a home. And today many black homeowners still face obstacles that white homeowners do not.